Sources tell Buster Olney of ESPN.com that Pujols will not accept any trade proposal. And with his 10 and 5 rights, he has every right to do so. There’s always the chance he could change his mind, but we should probably assume that he’ll be a Cardinal this season no matter what. Obviously the Cardinals are going to have to fork over a ton of cash to keep Pujols long term. The SportsDome suggested giving him a working key to the city. But I'm sure they can raise enough funds by putting the Arch on Craigslist or adding a "Pujols tax" to every bottle of Bud Light. In his first 10 years in the league, Pujols has racked up 80.6 Wins Above Replacement. To put that into perspective, let's look at my favorite tool at Fangraphs, the War Graph. 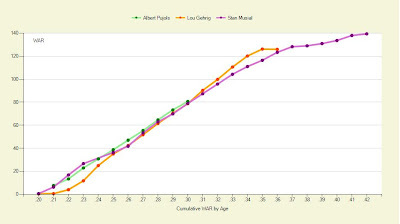 Here's Pujols' cumulative WAR by age compared to some guy named Stan Musial and former Yankee pinch hitter Lou Gehrig. Click to embiggen. The 31-year-old slugger has 408 home runs and a career .331/.426/.624 line. That's such a good looking line it wouldn't even let me buy it a drink. Dave Cameron figured Pujols would be worth +42.5 WAR during a 10-year contract from 2012 through 2021. In cash, that would be about $267 million. 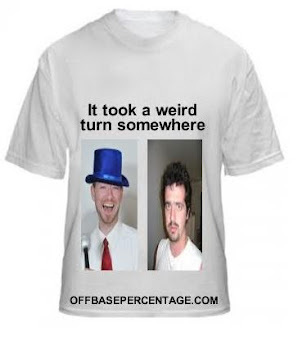 Cameron also said somewhere (that guy is everywhere) that he wouldn't mind giving Pujols 10-years and $300 million considering the extra bump for being the entire franchise. If he added $300 million to the $100M or so he's already made, he could finally buy Rhode Island and hunt hobos for sport in the off-season. Or was that my fantasy? Either way, that's a lot of money. That would be good for 12th place all time, ahead of Gehrig and behind Eddie Collins.